From the 6 – 10 January, the King of Rock n’ Roll returns to Sydney with a ‘Fun in Acapulco’ party to celebrate the great man’s life, known as the Parkes Elvis Festival. It’s all about sticking a sombrero on your head, grabbing those maracas and spending five days of musical bliss at this tribute event. With covers by US’s Donny Edwards ‘Live from Vegas,’ tickets are now available to purchase. Starting from 9.00am on the 6th, the Elvis Central merchandise store will be open. At the same time, the King’s Castle Elvis Exhibition will be open alongside the Elvis Lennox private Collection. If you’re in the mood to check out up and comers, the Busking Competition will take place daily at the NRMA Festival Boulevard. Vote for your favourite busker to win a prize! Taking the event to another level, Bingo with Elvis will be at 10.30am or you can step back 30 minutes to attend an Audience with Steve Binder and then hop over to bingo. On Thursday, there is an early bird Poet’s Breakfast at the extortionate time of 6.30am for an hour and after you’ve packed your stomach to the brim, get ready for the free film at 10.00am. Is Karaoke your go to? Then you’re in luck as Big Al’s hosting a sing along at 6.30pm but you’ll need to warble fast, as the Elvis Trivia takes place at 7.00pm. Donny will be on stage at 8.00pm and by the next morning, you’ll be right as rain for the Photography Competition Exhibition. This is alongside the Edible Art Competition while later in the day, An Audience with Steve Binder ensures a repeat performance. Headlining that same night is the King of Rock n Roll Concert series at 8.00pm. On Saturday and well into your blue suede shoes, the Ultimate Elvis Tribute Artist Contest Finale will take place at 2.00pm, with before & after entertainment such as Cars of the Era Show, Carmine: One Night of Elvis and a Trilogy: Three Decades of Elvis. Honestly, by the time you reach the last day (Sunday) and you’re all shook up, the 9.00am Gospel Service will get your hands a waiving, followed by The 68’ Special Concert Series and The Ultimates, finishing off the five day extravaganza. Ticket prices vary per event so check the calendar for many freebie entertainment attractions and remember to start tweeting #parkeselvis. 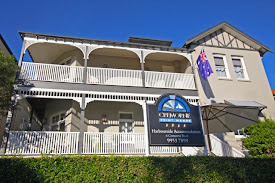 It’s a five hour drive from Cremorne Point so if you’re visiting NSW, make sure you rent a car for a few days, hop east and when you’re feeling more like a city Hound Dog, head back to Cremorne Point Manor. The views of the Sydney Harbour are stunning so if you have Suspicious Minds, check our home page video and it’ll ensure a huge WOW factor.